There is a reason behind why I yawn or laugh when football fans wax nostalgic about the Oklahoma Sooners, Alabama Crimson Tide or Notre Dame Fighting Irish teams of the 1940s, 50s or 60s. I do so because I do not believe that those all white teams would have stood a chance against the dominant Black College football teams of their era. During this period of segregation, the overwhelming majority of the best black football players played for Historically Black Colleges and Universities. I note “majority” in that while segregation was the norm in the south, colleges in the north, midwest and west enrolled a few black student-athletes decades before Jim Crow ended in the south. As the population of blacks and black football players was higher in the south, HBCU powers like Florida A&M University, Grambling State University, Tennessee State University and Southern University, to name a few, enrolled the cream of the crop each year. Further, when their student days were done, these star HBCU ball players later were drafted or signed free agent contracts with NFL and AFL football teams. With integration beginning in earnest at S.E.C. and ACC schools in the late 60’s, gradually some of the best black high school football players began enrolling at predominantly white schools. HBCU’s still enrolled their fair share of top black athletes, however, and as late as 1974, Ed “Too Tall” Jones from Tennessee State University, an HBCU, was the first selection of the first round of that year’s draft, going to the Dallas Cowboys. Henry “Killer” Lawrence from Florida A&M would be drafted several selections later in the first round that year by the Oakland Raiders and the round would end with the Miami Dolphins selecting Donald Reese from Jackson State University, also an HBCU. In the second round of that same draft, five of the first 15 selections were from HBCU’s with three more hailing from Jones’ Tennessee State team; one from Alcorn A&M (now State) and another from Johnson C. Smith University. The 1975 draft was similarly successful for HBCU’s, with Walter Payton from Jackson State going fourth in the first round to the Chicago Bears, his teammate Robert Brazile going sixth to the Houston Oilers and Gary Johnson of Grambling going eighth to the San Diego Chargers. After the 1975 draft, over the next ten years, HBCU’s still served as fertile ground for NFL prospects, and in 1978, Florida A&M University won the inaugural NCAA Division I-AA football championship. But after 1978, there was a gradual decline in black athletes enrolling at HBCU’s. Why? Simply stated, the proliferation of television contracts for college football exposure and the emergence of ESPN soon sounded the death knell for HBCU football. As late as the early 80’s, ABC television was the industry leader in airing college football games in conjunction with what was then termed the CFA or College Football Association. At this time, several of the aforementioned HBCU’s, particularly FAMU and Tennessee State, had several games aired on regional or national television each year. FAMU’s 1978 national championship win in the inaugural Division 1-AA title game was aired on ABC and as my family was living in Maryland at the time, it was my first opportunity to watch the “Rattlers” for which my father had played for in the early 60’s. The ability to see FAMU and other schools play on tv would soon cease, however, as new television contracts virtually shut out HBCU’s from being televised. By the late 80’s, other than BET’s Black College Game of the Week, one could not find an HBCU on network television. 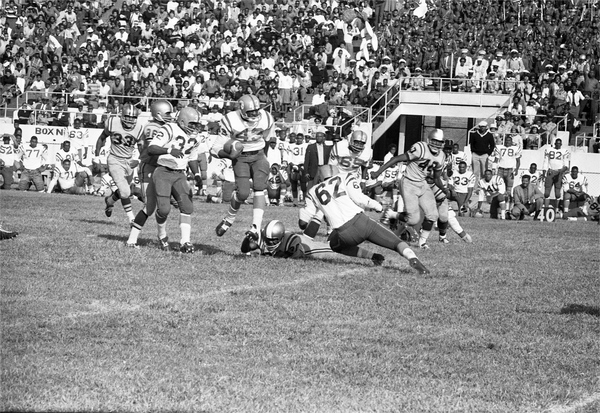 This was critical because by the mid-80’s, many of the coaches and administrators in southern high schools who had attended or played at HBCU’s during Jim Crow and thus served as de facto recruiters, like my father’s high school coach, Nathaniel “Traz” Powell of Miami’s then George Washington Carver High School, had either retired, died, or been relegated to district office jobs or jobs at middle schools that deleted their daily influence on black athletes. Even more crucially was that as predominantly white colleges earned millions of dollars in revenue from television contracts, this revenue was used to build state of the art weight rooms, plush athletics dormitories and stadium expansions that awed young athletes on recruiting visits. Simply stated, HBCU’s could not keep up with the funding race and many star athletes who may have been aware that their heroes like Too Tall Jones, John Stallworth of the Pittsburgh Steelers, Ken Riley of the Cincinnatti Bengals and Jerry Rice of the San Francisco 49’ers may have attended HBCU’s, the same were hesitant to follow in their footsteps when given options to have national or international exposure at Florida, Miami or Florida State as opposed to attending FAMU or Bethune Cookman and receiving no television exposure. Again, during the HBCU heyday, legendary coaches like FAMU’s Jake Gaither, Grambling’s Eddie Robinson, Tennessee State’s John Merritt and Southern’s Arnett Mumford did not have to work hard to get the best black players from Florida, Tennessee or Louisiana. Black kids then grew up dreaming of playing for these legends, much as black kids today dream of playing for Nick Saban of Alabama, Dabo Swinney of Clemson, or Urban Meyer of Ohio State. Indeed, the clear funding difficulties of HBCUs today is a reason why some black athletes who eventually matriculate at S.E.C. or ACC schools would have considered an HBCU if scouts and/or coaches had done a more aggressive job recruiting them. Some HBCU coaches are working hard to reverse this trend, however, I am friends or relatives with the parents of some young prospects who will state that their sons are not even contacted by HBCU’s during the recruiting process. As such, there is an interesting dilemma among some black football fans in that on the one hand, many of us long for the glory days of HBCU football without understanding that due to the aforementioned reasons, those days may never return. There is a sense of irony in this to me in that it is clear that many of the major colleges that now enroll black athletes left and right do so for their athletic prowess, not their academic gifts in many instances. This is even more interesting when considering that some black students who are not athletes but have good or even great grades and test scores are denied admission to highly selective public universities like Florida, Florida State, Georgia or Texas, but an athlete with minimal academic talent, some who are barely literate, gain admission because they can play ball. But the fact remains that this issue, while ripe with nostalgia for many, still boils down to simple economics. In essence, top black athlete + television contract = big money and exposure.